“I know your secret, baby girl!” Carrie reread the message line of the email that had just appeared on her private email. Deciding that it was probably just a scam of some kind, Carrie clicked the delete button. Five minutes later, biting her lower lip between her teeth in a nervous gesture, Carrie clicked on the trash icon in her email to pull the message back to her in box. Should she open it or not? It was the baby girl reference that was worrying her. Just over a year ago, Carrie had accidentally opened a site on the internet that had lots of pictures of adults dressed as children. They were all carefully attended by “mommies and daddies” that loved them. That first time, she’d quickly clicked off of that site but over the last few months, Carrie had gone back frequently. Working as a lawyer in an exclusive downtown firm, Carrie was used to making decisions for not only herself but her clients. The pressure of all the responsibility that came with her position was often intense. Peoples’ lives and their futures depended upon her. What would it feel like to give complete control to someone else? It sounded like heaven to Carrie. So begins the third story in the series of "Littles." Will the handsome Mr. Covington be able to convince Carrie to let him be her age play Daddy? He'll do his best to take special care of his Little. 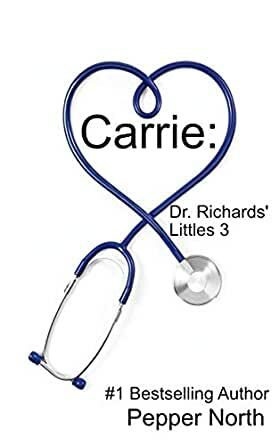 With a little help from Dr. Richards', Carrie will soon be looked after very carefully. Characters from the first and second novel in this series reappear to continue their stories. You do not need to read the stories in order. All are complete stories. The books in this series will feature invasive medical treatments, including thorough examinations and enemas when required, as well as diaper changes, spankings and other punishments. If you are offended by any of these or by age play, this is not the book or series for you. The intro felt more natural than the last story, especially given Thomas’s computer skills. I love their relationship, but would love longer books. Some parts felt rushed and repetitive and the new and unique aspects of this story felt rushed. Overall, I enjoyed it and want more of these fun stories. This story is absolutely beautiful. Thomas and Carrie are amazingly sweet characters. I think the way he contacts Carrie is so cool. I really enjoying this series. The writing and flow of this book is done well. I do recommend this book. The concept of Littles is interesting to say the least. Stories are nicely written,one does not feel that any malice or cruelty is intended.